The incubation period (time from virus entry into the body until disease occurs) of rabies is variable and depends on the site of the bite, the amount of virus introduced, and the species that is bitten. Once the virus is injected into the body, it replicates in muscle cells, then it spreads to the nerves that supply the muscle cells. Rabies virus does not spread through the blood stream as in most other viral infections. The virus spreads by going up the nerves that are infected to the spinal cord, then eventually to the brain. This transport period requires a minimum of 21 days in dogs and people. Once in the spinal cord the virus flows up the cerebral spinal fluid to the brain as well as migrating up the spinal cord in neurons. The closer the bite is to the brain or spinal cord the shorter the transport period. Heavily innervated (large numbers of nerves, e.g. face and hands) areas transport the virus more quickly. In naturally occurring cases the incubation period before clinical signs are seen is 3 weeks to 6 months (average, 3 to 8 weeks) in dogs , 2 to 6 weeks in cats, and 3 weeks to 12 months (average, 3 to 6 weeks) in people. After the virus enters the spinal cord, spread to the brain is rapid, the nerves innervating the limb that was bitten may become paralyzed and a total body paralysis may occur shortly after the brain is affected. Paralysis of the larynx and lower jaw occurs shortly after the brain is infected. Following viral growth and replication in the brain the virus spreads to other body tissues. The cranial nerves spread the virus to the salivary glands. The saliva becomes infective and since the larynx is paralyzed it cannot be swallowed and foams out the mouth. The excretion (external spread of virus through saliva) of virus occurs for a period just prior to neurologic signs until the animal dies which is usually 20 days or less. Most public health laws require a 10 day rabies observation period following a bite from a suspected dog, or cat because the period of virus shedding prior to neurologic signs is 1 to 5 days.. Therefore, if a pet were carrying rabies at the time of the bite he would start showing signs within 10 days of the bite. Rabies can affect the animal in many ways causing a variety of signs that range from normal behavior to rage and furious behavior to complete paralysis. The first classical phase begins with an animal that shows apprehension, nervousness, anxiety, and a variable fever. Friendly animals become shy or irritable and may snap, whereas fractious animals become more docile and affectionate. The pupils usually dilate. The animals will usually bite at or chew the site where he was bitten until it bleeds. This period will last for only 2 to 3 days. The furious stage of the disease lasts from 1 to 7 days. The animals become irritable and fearful of light. They over-respond to sounds or quick movements. As they become more restless they begin to roam, usually becoming more irritable and vicious. Dogs may eat wood or other objects. They usually will avoid contact with people but when caged they become disoriented and will bite the bars or walls. Muscular incoordination develops and seizures may happen as this phase progresses. If they do not die during a seizure they usually progress to paralysis then die. Cats more consistently develop the furious form of the disease and may make vicious attempts to attack anyone moving. Some cats will run continuously until they die of exhaustion. The dumb or paralytic phase usually develops within 2 to 4 days after the first signs develop. Paralysis of the larynx develops as well as loss of control of the face and jaw muscles. The dog begins to salivate excessively and rapid breathing whips the saliva into frothy foam. Dogs may be thought to be “choking on a bone” causing the veterinarian to become exposed during an examination. The paralytic stage lasts for 2 to 4 days. The animals usually go into a coma and dies. The paralytic disease in cats follows the furious stage at around the fifth day of illness. This stage in cats may be the only stage seen. The typical clinical signs of a rabid animal usually cause the veterinarian to suspect rabies. Because of the possibility of an animal not showing clinical signs or of an animal bite before clinical signs, rabies should be considered in any disease, which affects the brain, or in any animal who bites a human. There are no blood tests or biochemical changes in the body that are typical for rabies. The brain of the affected animals must be tested to be sure that rabies is or is not present. Any animal suspected of having rabies based on clinical signs is assumed to have rabies until the tests come back negative. Handling live rabies suspected animals is dangerous and should be done with great care using catchpoles, cages or heavy gloves. The local animals control officers will occasionally ask us to perform euthanasia and decapitation on rabies suspect animals. All tissues of a rabid animal are infectious to people. Gloves and protective clothing and masks should be worn when handling these cases. The animal’s head is removed without the aid of saws or ax to prevent spread of tissue by splatter. The brain is left within the skull and sent to the lab refrigerated or on ice. DO NOT FREEZE A RABIES SUSPECT HEAD. The rest of the carcass is double bagged and marked contagious. Clorox is used to clean any surfaces that contacted the animal. The local rabies control officers will take care of handling transportation of a rabies suspect to the lab. We must keep a log of all animals sent for testing. This log will specify when the animal was euthanized and when the head was sent for testing and what the result was. The head should never be put in the mail or sent through any courier service the does not know what is in the package. There have been cases where entire post offices have been exposed by an infected head from a rabid animal that was sent through the mail. 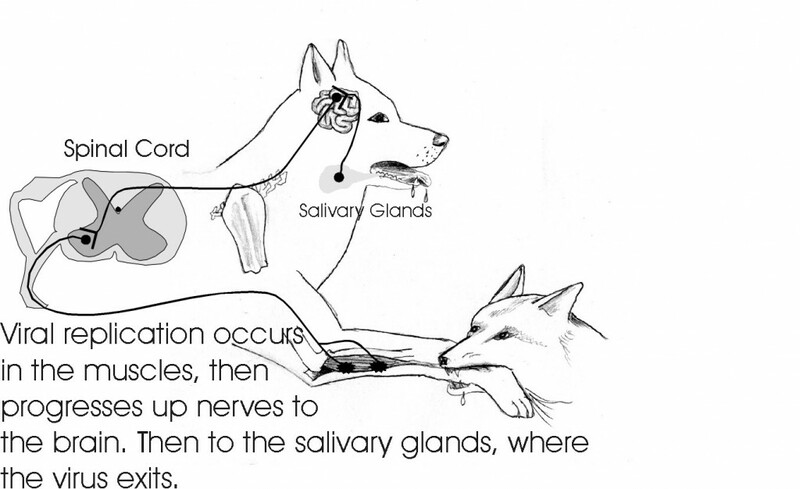 If the head is lost or misplaced or decomposed when it arrives at the lab then the bite victim(s) are assumed to be infected with rabies and are treated accordingly. Freezing the head is not acceptable because it damages the cell structure of the brain. It also delays processing by the lab because they have to wait until it thaws before they can process it. The brain is tested for rabies by staining the cells with a special fluorescent dye that can be seen under a special microscope. The test can tell any animal that has rabies even before the animal starts showing signs of the illness. Vaccination of pets for rabies has be the single most effective way of reducing the number of rabies infected humans. Vaccines are administered at 3 months of age and are repeated at yearly or ever three year intervals. In Texas the yearly vaccine booster is the law. In other states a three year vaccine interval is allowed. Currently only 12 states require rabies vaccination of cats by law. Texas is one of the states that requires vaccination of cats. Compendium of Animal Rabies Control, 1997 National Association of State Public Health Veterinarians, Inc.
A healthy dog or cat that bites a person should be confined and observed for 10 days; it is recommended that rabies vaccine not be administered during the observation period. Such animals should be evaluated by a veterinarian at the first sign of illness during confinement. Any illness in the animal should be reported immediately to the local health department. If signs suggestive of rabies develop, the animal should be euthanized, its head removed, and the head shipped under refrigeration (not frozen) for examination of the brain by a qualified laboratory designated by the local or state health department. Any stray or unwanted dog or cat that bites a person may be euthanized immediately and the head submitted as described above for rabies examination. Other biting animals that might have exposed a person to rabies should be reported immediately to the local health department. Prior vaccination of an animal may not preclude the necessity for euthanasia and testing if the period of virus shedding is unknown for that species. Management of animals other than dogs and cats depends on the species, the circumstances of the bite, the epidemiology of rabies in the area, and the biting animal’s history, current health status, and potential for exposure to rabies.